Be available to drop everything and visit someone in the hospital. Be available to walk a painful road of grief and loss with someone. Be available to play a game with your son even when you are dog tired from all the errands you ran that day. Be available to spend time with Me even when you don’t “feel” anything! Be available to serve at church even if it is an inconvenience to your family. Be available to talk to the lady in your neighborhood who no one else likes. 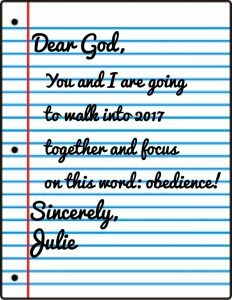 In 2017, I feel like God wants me to focus on “obedience.” In my spirit, I heard the word “obedience,” but I waited for a different word. And waited. And waited. 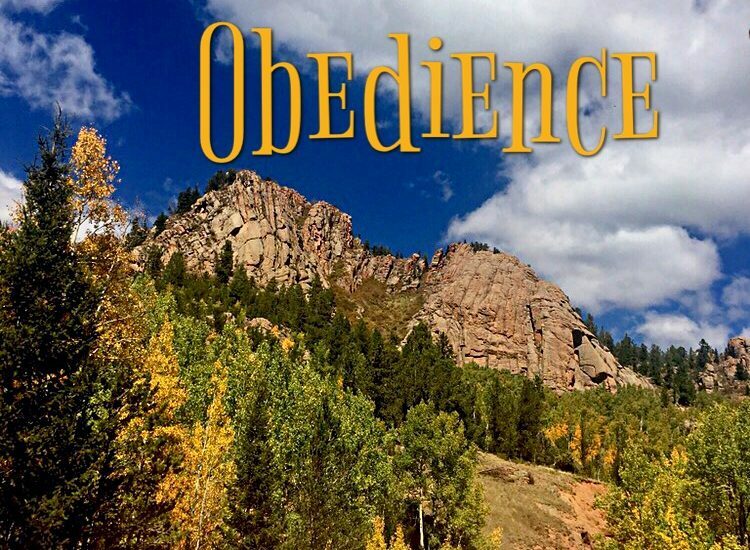 I mean, really, obedience?! I might as well just put a big fat “F” on my spiritual report card right now. I am still reeling from something in 2016 where I didn’t obey and the fallout was painful. To be honest, it feels restrictive! Why couldn’t I have more of a flowery word like: Embrace, Expand or Fulfilled? What if I fail again and again! Won’t this year just be a miserable failure then? I’m going to let You down, God! I’m weak! 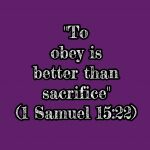 How prideful of me to think I can even strive to obey the entire year! (I think it’s kind of funny that I didn’t want this to be my word. I didn’t want to obey what I felt He was telling me.) LOL!! !